When it comes to celebrating the most precious moments of your life, choosing the right location is extremely important. Imagine a romantic evening with your significant other in a picture-perfect setting as the mesmerizing blue backdrop gradually melts into the marvelous hues of red and orange. 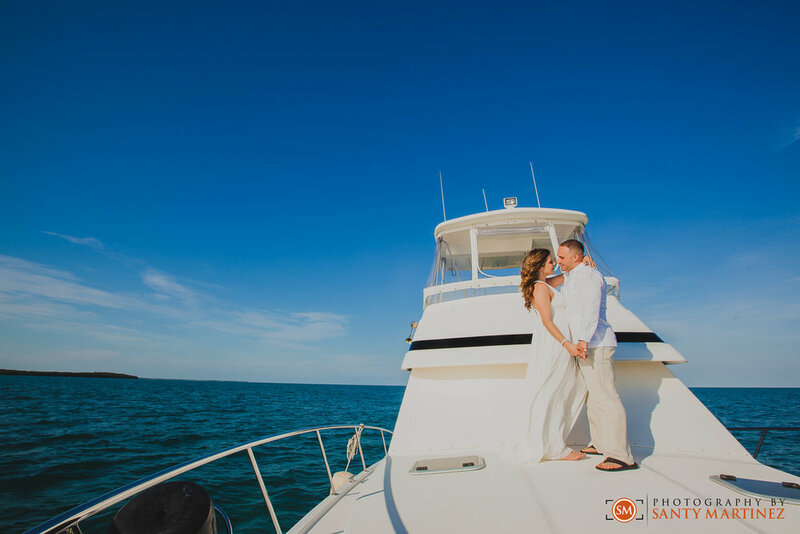 That was just one of the reasons why the newly engaged couple, Jessica and Jesse, chose this magnificent boating dock in Key Largo, Florida as the site for their engagement photo shoot. The majestic ocean and the multi-hued sky provided a perfect backdrop for the delightful session. Jessica and Jesse have decided to go for a cool wedding in December, and were looking for a photographer to preserve the beautiful memories of their big day. This couple came to visit us at our Kendall studio back in January. They found us by the recommendation of Nicole of Nicole Joy Events. 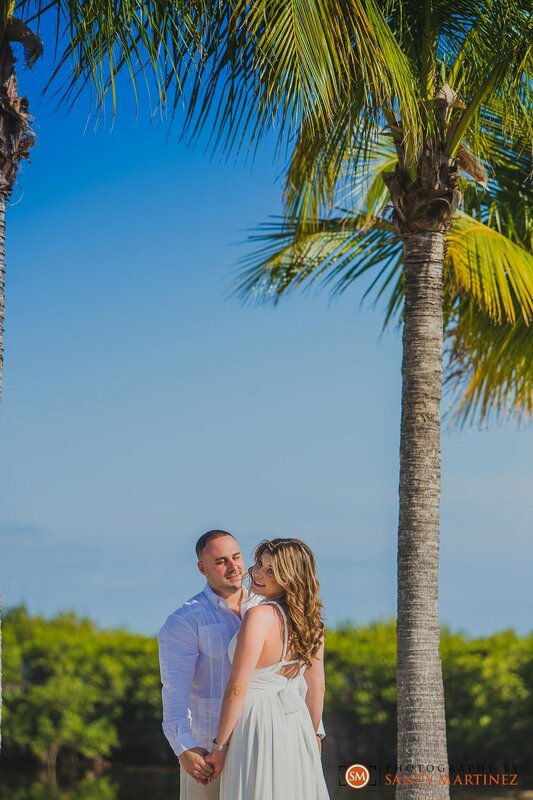 Nicole is great friend and no doubt one the top wedding planners in South Florida. A huge shout out to her for bringing this lovely couple into our lives. It is always a joy to work with her. It was such a fun time chatting at the studio and we felt the instant connection. We are overjoyed that they are inviting us to be a part of the wonderful journey they are about to embark on. Living in Miami Jessica and Jesse’s fondness for boats led to the selection of this location. This venue holds a strong sentimental value for the couple. 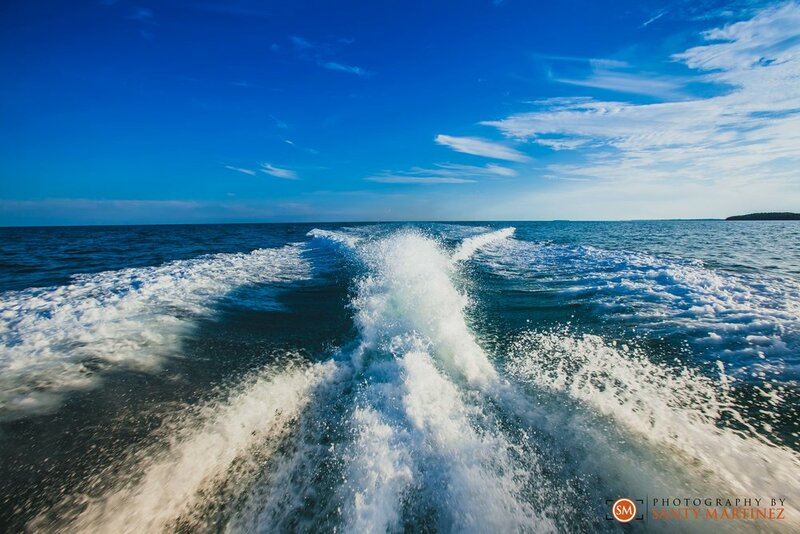 They frequently enjoy boat trips with family and friends to the beautiful sandbars around the Keys and beyond. We also have to mention their love for the University of Miami Hurricanes! These two bleed orange and green and know that it's All about the U! That being said, we couldn't continue taking photos without incorporating a little Hurricane pride. It was only appropriate to bring a little of their personality into the shoot. It brought a little extra fun to their session! Jessica and Jesse are one of the most exciting couples we have worked with. 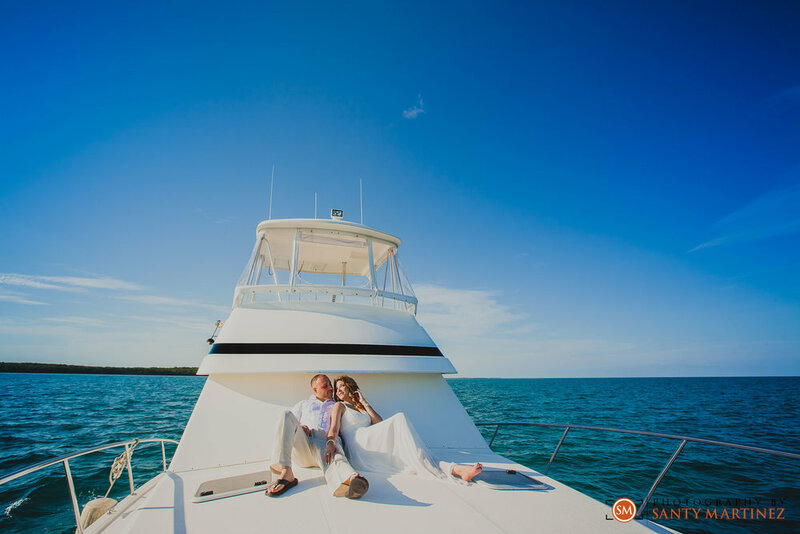 The day of the session, we met the adventurous souls at Jesse's family home in Key Largo before we got on the boat and headed out to sea. Complementing each other, the blue sky and the vast ocean gave us a perfect background to work with. The couple had a brilliant time and they didn’t shy away from telling us their ideas for the shoot as well as giving us creative freedom. The collaboration made it even more enjoyable for everyone present there that day. We love the way their personalities shine bright in each photo we clicked. The Keys boasts some of the most beautiful sunsets in the world. This is why Jessica and Jessie chose to end their session at one of their favorite rendezvous, Snook’s Bayside Restaurant and Grand Tiki. This ocean-side restaurant offered front row seats. So as the sun set on their soon-to-be new beginning in Key Largo, the gorgeous sky painted the perfect picture for an unforgettable end to a beautiful. The horizon provided just the right lighting, adding to the enchanting glow that was already present on their beautiful faces. We are so pumped to shoot their wedding later this year! If this session was any indicator of the fun we will have, than we know it's going to be a blast. We hope you enjoy their photos!